Okay, NO, I am not the ghost of spoiled Halloween fun. The candy will arrive. Probably more than its possible for the kid to eat, and some of it may become "invisible" over the few days after Halloween. But there will be candy. I just like to try and get a few healthy snacks in before the candy. Let's call it a last defensive shield against the sugar-frenzy to come. More likely, its a band-aid on any raging gash of mom guilt I feel and the kid will be just fine. Even so, I am glad its just once a year. You can catch me on KCUR talking about a Healthy Halloween with the following recipes for a fun dinner before the trick-or-treating begins. Using a holiday fun theme helps the healthier recipes get a bit of love from your little goblins and ghouls, too. 1. Set an oven rack in the lowest position and preheat the oven to 350 degrees F. Skip to step 4 if using canned pumpkin. 2. To prepare the pumpkin, cut it in half and scrape out the seeds and pulp. Lightly oil the skin and place on a baking sheet, cut side down. Bake for about 1 hour, until the sides of the pumpkin give easily when pressed. 4. Heat the remaining 2 tablespoons olive oil in a large stockpot over medium-low heat. Add the onion, carrot, sage, and thyme. Sweat the vegetables for about 10 minutes. 5. Add the flour and stir to coat the veggies and cook the flour for a couple minutes. Add the stock and the cider and bring to a boil. Reduce the heat to a simmer. Simmer, stirring occasionally to let the soup thicken a bit, for 10 minutes. Add the pumpkin and stir, bringing back to a simmer. Add the milk, carefully bringing the soup back to a simmer. Last, add the cheese in small handfuls, stirring as you go to melt it in completely. Taste and adjust the seasonings with salt and pepper as needed. 1. Using a small ghost cookie cutter, cut ghost shapes out from the bread. Save the crusts and extra, diced, in a plastic bag in the freezer for your Thanksgiving stuffing. Or, you can drizzle the crusts with extra olive oil and bake for salad croutons. 2. Place the bread ghosts on a cookie sheet and drizzle with the olive oil. Bake for five minutes in the 350-degree oven until crisp. Remove from oven and carefully spread each ghost with softened goat cheese, or sprinkle with extra white cheddar. 3. Bake for five more minutes until the cheese melts and you get bits of golden brown showing. Remove from oven. “Float” one ghost on each serving of soup. 1. 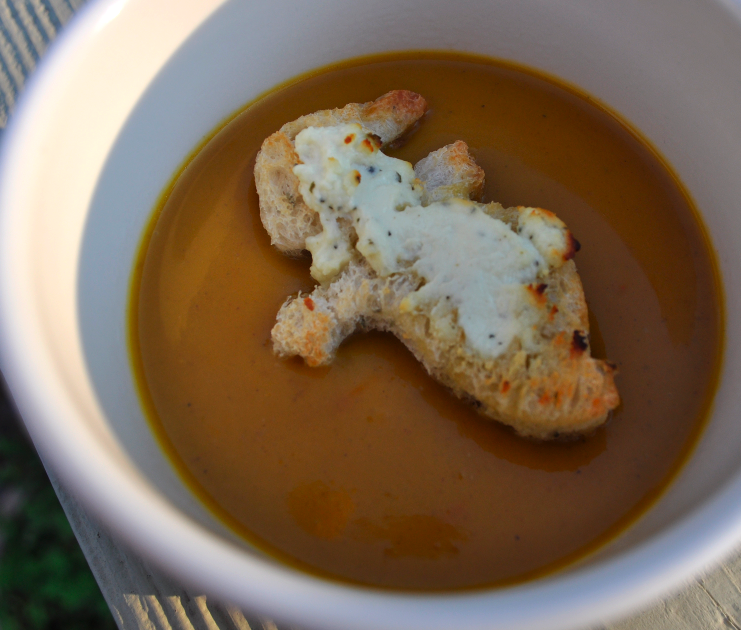 Using a small pumpkin cookie cutter, cut pumpkin shapes out from the bread. Save the crusts and extra, diced, in a plastic bag in the freezer for your Thanksgiving stuffing. Or, you can drizzle the crusts with extra olive oil and bake for salad croutons. 2. Place the pumpkins on a cookie sheet and drizzle with the olive oil. Bake for five minutes in the 350-degree oven until crisp. Remove from oven and allow to cool. 3. 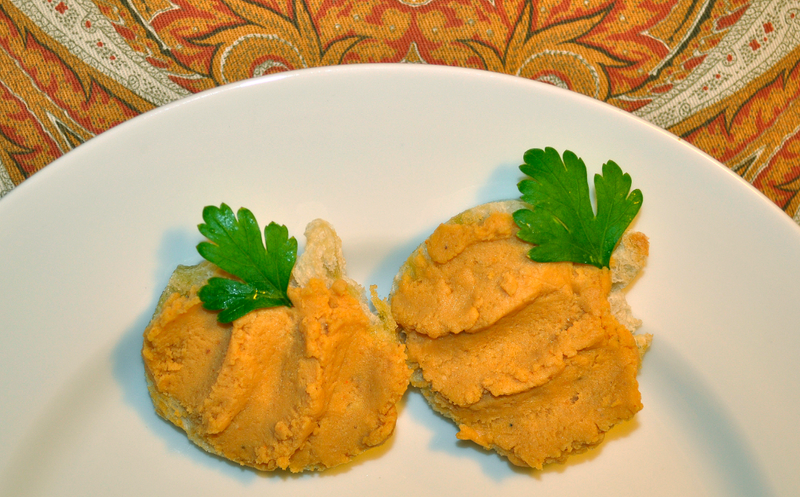 Spread each pumpkin with the hummus below, adding a parsley leaf on each “stem” for garnish. Pulse in food processor until smooth, adding a bit more olive oil if needed. Serve on the pumpkin bruscetta, or with pita, pita chips or vegetables. Beth will be doing a book signing, along with another local author, Jill Silva, at the Kansas City Store on the Plaza, 314 Ward Parkway, KCMO 64112, on Saturday, November 3, 1:30 to 3:30 pm. In the book, Beth helps parents understand picky eating behaviors; where they originate, and how to deal with them creatively to get kids to eat better — without any sneaking, lying or fights. And without the judging or holier-than-thou advice that parents don’t want and don’t need. In addition to her book, Beth writes for EatLocalChallenge.com, Martha Stewart’s Whole Living, and Dr. Greene. I pack my child's lunch every day. When it comes to food, yes, I am a helicopter mom. Not that I don't have good reason to worry. Even with the improved school meals, I am still concerned about the meat sourcing and continued use of heavily processed foods. So, each day I still pack my kiddo a nice little lunch box with each item all segregated just the way she likes it. This works, except for the morning — in the 10 minutes from car to school room — the lunch got dropkicked into the cubby or at least violently shaken by an unseen force ("I don't know, it just was like that, Mom.") and my well-spaced carrots then mix with the applesauce and whole grain sandwich — and the lunch got ruined. The kid ended up in the lunch line. I find out when I get an email at work that her lunch account has a negative balance. I keep it at zero just because I did NOT want her to buy "chocolate" milk and juice to go with her lunch. Negative balance? I get the story at home later. "So," I asked. "What did you pick from the lunch line?" "Well, I got a ham sandwich, apple and salad," she replied. I had a proud mom moment there. She chose salad! That doesn't mean she ate it, but she at least chose it. The choice thing is my other concern with school lunches. On any given day, kids can choose one of three hot meal items, or a sandwich, or sweet yogurt and a muffin (which somehow count as a protein when I know the diabetic exchanges count that as two carbs), or sunbutter on wheat bread and a cheese stick. You can imagine what most kids will pick, and it is generally the fried or sweet options. The salad comes from one of our lunch room's new features, thanks to the new lunch guidelines. It's called a Harvest Bar. In theory, the bar highlights seasonal produce plus other vegetable and fruit options. In practice, canned fruits and vegetables are more of the usual suspects. "Mom, I want you to come to lunch with me one day," my little girl asks me. It's a big deal at grade school — the early years at least — to have a mom visit. Moms are like rock stars in these early years. This fades, I know. Enjoy it now. So, how can I refuse my kiddo? Plus, I owed the lunch lady some money now. I was both being called to my "red carpet" of mom stardom and being called on the carpet by the balance due for her lunch account. Time to pay my debt. I deliberately did not pack myself a lunch. I might have eaten a bit before I left the house, however. Armed with cell phone camera and the money I owed the lunch lady, it was time to get in line. Drinks are offered first. Flavored milks and no-sugar added juice are the top picks. The cartons are now half size of the ones I got when I was a kid. Of course, the only choice we had was lowfat, plain milk. And our milk wasn't produced with RBGH. Those were the good old days. The hot menu items left a bit to be desired. Fried "mini corn dogs" trigged my school-mystery-meat-phobia. A pizza pocket, which like the corn dogs was a heavily processed item reheated on site. With the new guidelines, the food manufacturers now add whole grain flour and in some instances reduce the amount of cheese used to lower the fat. Still, it's a frozen lump of processed stuff reheated. The other hot option was two whole wheat tortillas with melted cheese. For the sandwiches, the bread is now partially whole wheat. What they call "light wheat." Kids will eat this. In fact, even the most white bread-addicted kid will migrate to whole grain if the transition is gradual. At least, according to Harvard School of Public Health if not your first-grader. I chose the sunbutter sandwich. The kid chose ham and cheese. I despise corn dogs, even real ones. Off to the "harvest" bar. The bar is adorned with little stickers, "Must take at least a 1/2 cup of fruit and/or veggie." Um, kindergarteners and first graders don't really know fractions. Some don't read. And, if most of these kids have not cooked, they won't know what a "cup" means either. The signs need to be updated with a picture of what a serving looks like. The "harvest" bar also features the starchy vegetables first. Corn and French fries, anyone? Obviously, these were the most popular choices. But, I did see a few kids choose the carrots. Mine got salad. I chose the broccoli and carrot salad. Which was not bad. Fruit choices were canned mangoes, canned cherries, and apple slices. We both got mango and apples. My kid LOVES cherries. But, when she saw the canned cherries on the line, she asked me, "What are those?" "Um, cherries. I think," I replied. Overall, it was possible to eat a healthier lunch. I would say school lunches just went from an "F" to a "C-." Still, a "D" on the hot options. For many kids, these new guidelines represent the healthiest meal they will get all day. For some, it's the only meal they will get all day. For all of our kids, there's good reason to keep working to make that meal a healthy one. I'm ready to support my school in any step in the right direction. We all should. I'd like to see better options still — and less of those better options hitting the trash can. Better recipes, maybe? More food education at school and home? Yep, and yep. But, for now, thanks to schools for stepping up. I understand there's some backlash to the new guidelines. For those high school athletes who are limited on calories, how about you pack some extra healthy food for those special needs? You are not the average student. Deal with it yourself. Good grief, you kids will be VOTING in a year. You can drive. You can pack a few extra food items. Did you know the healthier you eat, the better your athletic performance will be? 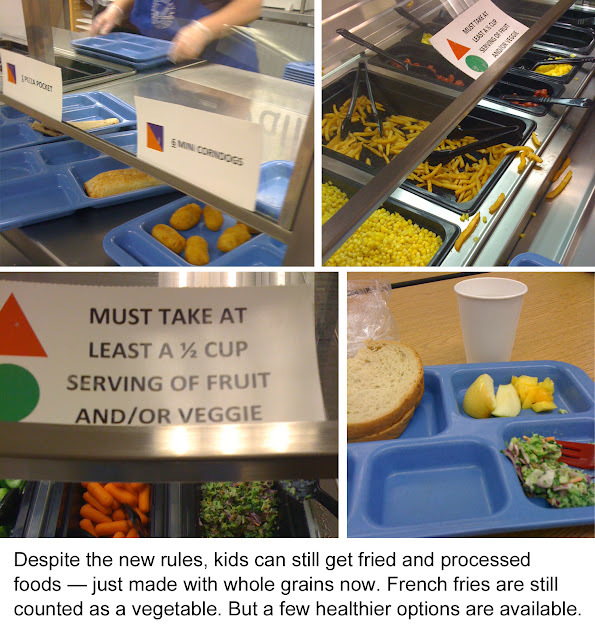 For the parents who have issues with the new lunches and their kids not eating them, know what? Your kids can still get those pizza pockets and corn dogs and fries. I wish they couldn't because it makes my kid's food habits worse with those options. But they can. Mine can get salad at least. For the politicians who are ready to cut costs and go backward, I can think of a lot more savings and government waste to go after than jeopardizing the health and future of our nation's kids. Can't you? You guys just spent more on negative political ads for just the presidential election than the school lunch program costs to feed 1,438,202 kids school lunch for a year. Go ahead, check my math. I vote we give the ads up and feed the kids better. $512 million sure could buy a lot of actual cherries. But, the broccoli salad was not bad. 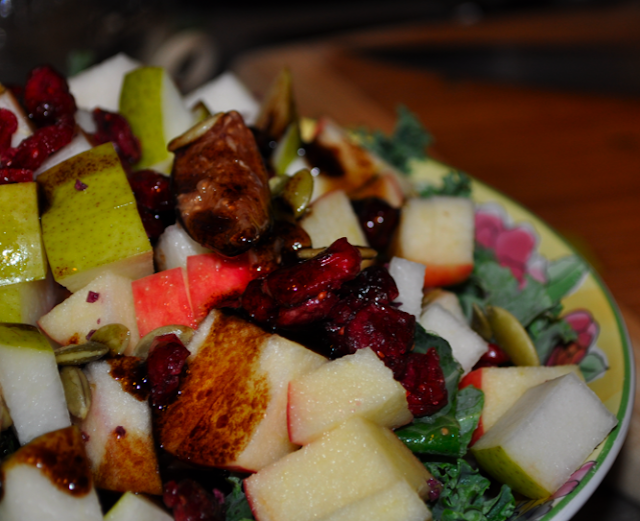 I'll be on the television show, Better KC, on KCTV 5 November 2, at 9 am making this easy, healthy Thanksgiving salad with seasonal fruits and kale. You can find me the next day at The Kansas City Store, Kansas City Store on the Plaza, 314 Ward Parkway, KCMO 64112, Saturday, Nov. 3rd, doing a book signing from 1:30-3:30.